(size of object in millimeters) / (size of object in mils) = range in meters. Just teach yourself to use the metric system. The beauty of the mil dot system is that it doesn't matter what units you use, as long as you are consistent. If the spacing of 1 mil through the scope is X units high, then it is 1000 X units distant. The units can be feet, yards, or meters, it doesn't matter. If you want the answer in yards, think of how many yards one mil subtends. Example: If one dot spacing is 0.5 yards (18") high, then the distance is 1000 * 0.5 = 500 yards away. 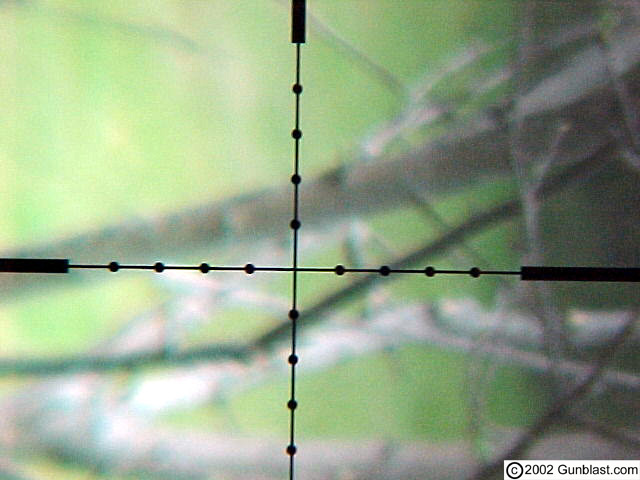 A 6' tall person would subtend 4 dots at 500 yards, or 2 dots at 1000 yards. If you want the answer in meters Mr Hugh's' advice is fine. The metric system has advantages at times. The problem with the mil dot system (as compared to a laser rangefinder) is in estimating the actual size of the target. Sometimes it's easy, sometimes not. Mil dot accuracy in terms of percent range accuracy will be the same as the error in estimating the target size. If you think a man is 6' tall and he's 2 mil high in the scope, but he's really 5'6" you will think he's at 1000 yards when in fact he's at 917 yards. If you're shooting a .308 you will shoot high by about 80 inches. Not even close, and that isn't considering any other error sources. At ranges 400-700 yards the mil dot system works pretty well. Closer than that you probably don't need anything other than an eyeball estimate (with a little practice). This beats the "hunter hangover" system by a long shot. I have second focal plane Bushnell fixed 10 x 40 scopes with DOA reticle. I bought a mil - mil reticle in first focal plane, and what a difference. The 2 advantages were: 1) zero of the scope and 2) estimating the distance of the object based on size at a distance using the reticle and how many mils it occupies. I am now a believer in mil - mil and first focal plane. I believe Primary Arms, Falcon and SWFA offer affordable and reliable FFP scopes. I have a Falcon M18. 4 - 18x50 and it cost me $400 Canadian Pesos. I believe in the KISS principle. Mil-Mil scope with 1st focal plane. No matter what scope magnification the scope is, it will always yield the correct adjustment.